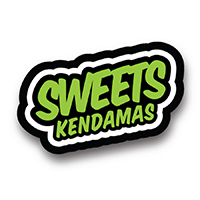 Sweets Kendama wanted to transform some of our favorite summer treats into Kendamas so they came up with the dessert series where there is something for everyone. This is the Prime Custom V14 Sherbet Stripe. It features a 4 stripe design with all t4he favorite Sherbet flavors. The summer vibes on this Kendama are strong. Prime Customs are Prime Kendamas, painted in the Sweets Lab. They want to provide a premium version of the Prime line, and show off what their in-house painters can do! Prime Customs have their own packaging, include a spinner bead and have a cross ken on the handle instead of the Sweets mark, but the shape, specs and measurements of the kendama are exactly the same as a regular Prime. Because Prime Customs are painted by hand, there may be some variation between what is pictured and what you receive. Customer evaluation for "Prime Custom V14 - Sherbet Stripe - Cushion Clear"